Details relating to the Slovakian Commemorative of 2013. 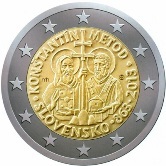 The coin commemorates the 1150th anniversary of Greek brothers Constantine and Methodius. They were Byzantian intellectuals and priests and worked as missionaries in the 9th century converting Slavic people to Christianity. Constantine was given the name St. Cyril and he developed what came to be known as the Cyrillic script – used in Russian, Bulgarian and Serbian. In the inner circle the brothers are shown, Constantine on the left holding a book which represents learning and faith. Methodius is on the right and with a church which represents faith and institutional Christanity. Between the two brothers is the double cross standing on three hills. Around the edge of the inner circle at the top is the inscription “KONSŠTANTÍN METOD” standing for Constantine Michael. Around the bottom “SLOVENSKO 863 2013”, showing the issuing country, the year being commemorated and the year of issue. To the left of Constantine are the initials mh of the designer and to the right of the Michael is the mint mark MK within a circle. From Slovakian Commemorative 2013 to euro coin collector.